Our top picks for your family stay. From camping adventures to a cottage on the beach. Whether you’re looking for a short stay or a longer break, you’ll find an exciting selection of accommodation options that are close to the action and suitable for all the family. Have a look at some of our top picks for places to stay across West Sussex. With 94 holiday properties available across the whole of West Sussex, including beach houses, period cottages and converted barns, Amberley House Cottage Holidays are an ideal getaway for family adventures. A good amount of homes are pet-friendly and offer amenities such as secure cycle storage, BBQ areas and washing facilities, providing everything you need for your stay. The Beach House is a small and welcoming bed and breakfast with a licenced restaurant in the heart of West Wittering. Known for its unspoiled sandy beach and natural beauty, with the historic city of Chichester on its doorstep, West Wittering is an ideal holidaying spot for families looking for the best of both worlds. Tucked along a quiet street, just a stone’s throw from the seafront, the Bijou Beach Cottage offers a cosy retreat for up to four guests in Bognor Regis. Explore local attractions including the pier and seaside adventure golf, or discover more about Bognor Regis with a family Treasure Hunt Trail. If you’re new to the outdoor-living experience, or don’t have all the necessary tools, have a look at Billycan Camping. You’ll be equipped with everything you need to get going, including tents, beds and your own BBQ, with a Full English breakfast hamper on Saturdays and complimentary camp stew served up on a Friday night. This 12th century cottage, complete with charming exposed beams and brickwork, offers a cosy family stay for up to four guests in the centre of Steyning. On the doorstep of The South Downs Way, 3 Church Street is an ideal base for families and outdoor enthusiasts, with a welcome pack on arrival, bicycle storage and an outside patio area for BBQs. A former photography studio within an 18th century building, The Penthouse offers luxury self-catering accommodation for up to eight guests. Providing a comfortable hideaway in the small town of Petworth, The Penthouse is a fantastic option for a larger family party looking to explore the local history with Petworth House and Park, antique shops and cafes nearby. Comfortable, stylish and perfect for families, The Salterns in Chichester Marina offers luxury self-catering apartments for weekends, short breaks and holidays. Situated in a designated area of outstanding natural beauty, there are private landscaped gardens, an onsite bistro, nearby beaches and wildlife to watch. Get off the grid and rediscover the art of simple living with a stay at Wild Boar Wood Campsite. 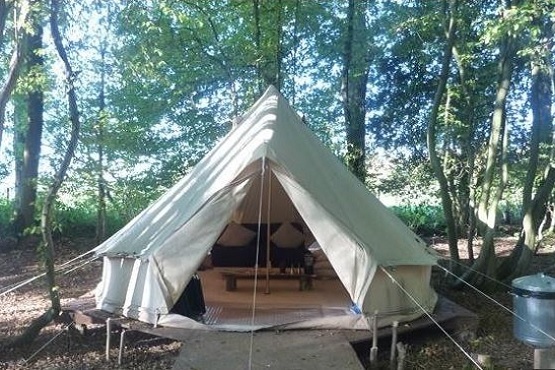 An Eco Camp in natural woodland settings, Wild Boar Wood is completely free of electricity to encourage a real camping experience, complete with an open fire pit and unique eco bucket showers. Bring your own kit or book a bell tent with futon for ease. These picks are just a snapshot of the diverse accommodation options available to help your family experience West Sussex. Check out our full list of recommendations.